This chapter deals with the responsibility of the EU under international law for ‘unilateral sanctions.’ Like States, international organizations may also adopt unilateral sanctions against States or other international organizations. The EU has been particularly active in this respect. 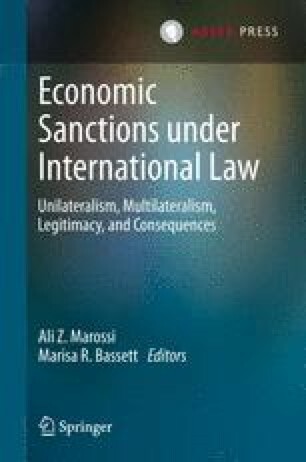 After some terminological clarifications regarding sanctions and countermeasures, the chapter examines EU practice in imposing unilateral sanctions on third States and sets out the conditions for legal resort to such sanctions. The chapter then proceeds to discuss the potential engagement of the international responsibility of the EU for the imposition of sanctions. If such measures are attributable to the EU, and they are in breach of the EU’s international obligations, then they must be justified as countermeasures. Otherwise the EU’s international responsibility will be engaged. The chapter then examines the mechanisms for implementing that international responsibility on the part of the States that have been unlawfully targeted by EU sanctions.